StateDemocracy is the first application ever built to connect US citizens to their federal and state lawmakers, allowing constituents to provide input on legislation in real time. Being ahead of our time in the early 2000s, we ran into several challenges to monitor key bills in 50 states, with enormous maintenance costs. Many legislators were not even using emails at that time. In 2007, we added two tools allowing citizens to register online and request an absentee ballot in any state for the 2008 Presidential Elections. We invested some $400,000 over 10 years of StateDemocracy, and in late 2010 decided to shut down the website. We gave away source code to several non-profits who were involved in online advocacy. In 1999, Shukoor Ahmed Founder of V-Empower, Inc. created www.statedemocracy.org to facilitate citizens and help them connect with their elected officials. Shukoor ran for Maryland House of Delegates in 1998 in District 23A (Bowie, Prince George’s County area). Despite his status as a naturalized citizen who only recently immigrated from India, and without deep ties yet in the district, his campaign proved to be a profound experience that helped Shukoor understand the challenges common citizens face -- most notably their difficulty in locating and communicating with their elected officials. During his door-to-door campaign, he was amazed to find that over 75% of the citizens lacked the very rudiments for democracy--because they didn’t even know the names of their own State House representatives! Using his solid background in Math (B.S.) and Computer Science (M.S. ), Shukoor teamed-up with some friends and launched www.MDdemocracy.com in early 2000. The website successfully enabled citizens throughout Maryland to dialog with their lawmakers, by merely providing their zip code and clicking to send. Each of these companies raised over $24 million…and went belly-up in less than 18 months. The only survivor was www.grassroots.com and it is still in business. However, the team behind Statedemocracy.org continued building upon its vision of civic engagement, but without a dime more of venture capital. Instead, Shukoor’s determined vision was funded largely by loans from his supportive family, friends and personal credit cards! In 2003, after some 3 years of investment and hard work, V-Empower incorporated the Statedemocracy.org Foundation as a 501(c)3 non-profit, dedicated to continually improving the ability of citizens to connect with their elected officials. Over its history, the dedicated people behind StateDemocracy.org are proud to have helped some 114,000 citizens participate in their democracy, with over $300,000 contributed by V-Empower to the Statedemocracy.org Foundation to make Shukoor’s civic dream a powerful democratic reality! In 2008, as candidates focus ever-increasing expenditures to get elected, it seems there is ever-fewer resources dedicated to facilitating democratic participation by our citizenry. But StateDemocracy.org continues to improve its civic engagement tools. The revamped website now offers more than just a connection between citizens and their lawmakers. Users now have tools allowing them to access voter registration and absentee ballots, as well as to locate their polling place. 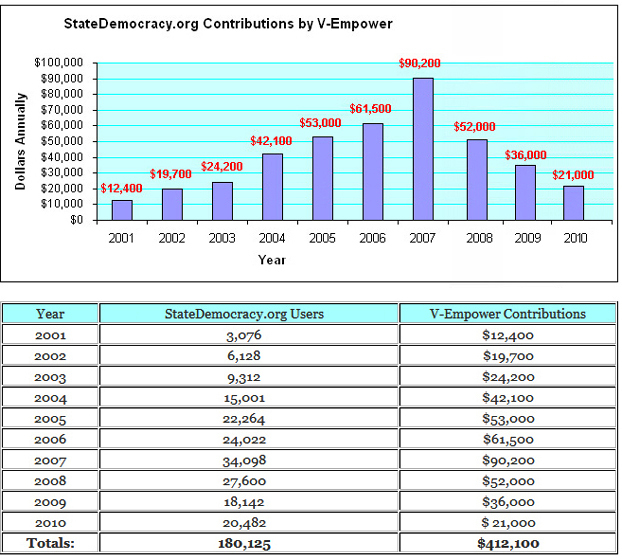 In 2007 alone, V-Empower contributed over $ 90,000 to revamp and expand the features offered by www.StateDemocracy.org as a public service to America’s voters. An effort is underway to strengthen the StateDemocracy.org Foundation Board of Directors with new blood, while also seeking sponsorships from corporations and benefactors. We closed State Democracy Foundation in December 2010 both the web application and legal non-profit entity. We would love to share our technical know-how, source code and our experience with those who are interested and they could contact shukoor at v-empower.com. New York, Mar 3 (IANS) Shukoor Ahmed practises what his technology preaches,so the Indian-American founder and CEO of statedemocracy.com, which helpspeople to reach out to government officials, plans to run for Maryland StateSenate. In the process, he is pitting himself against Democratic incumbent Senator Leo Green in the September 10 primary. When he started V-Empower in 1999, he had grown tired of the "disconnect" between elected officials and their constituents, Hyderabad-born Ahmed says. State Assembly in 1998 into V-Empower and developed statedemocracy.com. easier and gives you the options of sending them e-mail and feedback when any legislation is being debated," Ahmed told IANS. you want more funds to go to India, you could send it to all (officials) from the (U.S.) president down to the state." Ahmed plans to provide a periodic "report card" to users about how their various elected officials did. The site may be a few weeks old, but Ahmed says he has 1,200 registered users. If his ability to attract users is any measure, it might indicate his acumenin keeping in touch with voters in Prince Georges County from where he plans to spring his campaign for state senate. But Ahmed believes his Arab-sounding name may work against him, especially after September 11 because anti-Muslim emotions may be higher than otherwise. percent African American, two percent Asian, three percent Hispanic, and two percent others -- and the rest whites. reasons to run in the elections. "My county and district has major issues like education. It ranks at thebottom on several social indicators. Thats an issue where I have always felt my background in public policy helped me put together a good platform,"
He believes a majority of his constituents want public school choice. "Ihave been engaging citizens on different issues. I think I have reasonable rapport to be a viable candidate." In 1994-1995, he says, his interest in public policy and computers came together. "Although I was a recent immigrant, I ran for office. This is one of the countries where people will vote for you if you have the right solutions." He says his ethnicity may be a problem. "But a majority of my constituents know my name. have to take the initiative. Otherwise I would never find out." Townsend Kennedy for Governor of Maryland 2002 and candidate for Maryland House of Delegates 1998 among other things. legislators are directing constituents to his site. Statedemocracy.com has 51 domains -- one for each state and one for the District of Columbia and they run like nydemocracy.com or pademocracy.com. Ahmed bought the domain two years ago in 1999, when he figured the Internet was the tool of the future for democracy. grassroots.com. Of the three, voter.com closed down operations in February 2001 and is believed to have burnt many millions before going down. "We had near death experiences in the last two years. Those have strengthened us to deal with market uncertainties and survive and become profitable," he says. A "lifelong political junky," Ahmed says: "I always felt politics was an area where a lot of minorities look at the daunting task and just shy away." Armed with an American University, Washington, D.C. masters in public policy, his past political experience and technology background, plus a passion to make things better, Ahmed believes he has all the ingredients for public service. "At the end of it the only loss I can see is of money and time, and if I lose, I may lose because of the power of incumbency," says Ahmed who has been married to Nabeela Ahmed 14 years. They have two daughters -- Raaheela,8, and Shabnam, 6. A product of Osmania University, armed with BS in Computer Information System from Strayer University and a MA in Public Policy from American University, with a major in Lobbying and minor in Campaign Management, this multi-faceted personality founded V-Empower in 1999, since then Shukoor is the CEO. An article was published last month about V-Empower Inc. in Washington Post mentioning that It took more than two years and $300,000 for the four-person team to develop a working product that help small political organizations promote their causes more efficiently through the Web. Shukoor He has served in various capacities before embarking on V-Empower. Shukoor was the Communication Director for Bill Bradley of Maryland, who ran for President in the primaries of Democracts candidacy election, eventually making way for Al Gore. A political enthusiast, he ran for Maryland House of Delegates in 1998. He continues to remain a committed worker for the community and he contested for the post of State Delegate for Maryland again in the September 2002 elections. His major interests behind statedemocracy.com stem from his own campaigning days, while door knocking, Shukoor was shocked by the gap between elected officials and the citizens on simple issues of everyday life. This was when he decided to passionately pursue the concept of such a deep impacting tool, statedemocracy.com. Under his stewardship, the company saw a host of products being successfully launched in the market. The company’s primary launch pad was the political portal, www.statedemocracy.com. It is an umbrella web application, with 51 websites seated under the main application, each of which is dedicated to the promotion and betterment of democracy. Shukoor is a registered Democrat and a proactive, progressive and independent person at that. He was the Director of Technology for Jack Johnson, Candidate for County Executive 2002. Shukoor was also the Campaign Manager for Katina Johnstone, who ran for Congress in 2000 contesting from 13th District in New York. Shukoor took up the assignment as Director of Communications in Maryland for Bill Bradley, who ran for President. He was also the Field Director in Prince George’s County for Bill Bradley. Shukoor worked as a Legislative Aide for Delegate John Giannetti during the 1999 Legislative Session. He was a Candidate for Maryland House of Delegates in 1998. He had also served as Vice-President of the Democratic Club of Bowie during 1994-1996, promoting the political involvement of Bowie residents and further ensuring the accurate dispensation of local political information. Shukoor was a Member of the Asian Pacific Advisory Board to the County Executive during 1995-1997, thus rendering important and objective information for the needs of the Asian-American Citizens. He has also served in other capacities like Treasurer for the Democratic Central Committee Candidate Donald Beach in 1994, Member of the Governor Oden Bowie’s Democratic Club since May 1993. Shukoor has also volunteered for the campaigns of political candidates including Congressmen Steny Hoyer (1992 District 5), Jim Moran (1992 District 8) and At Large Montgomery County Councilman Issaiah Legget in 1994. Shukoor has been serving the public for over a decade. He is a leader, a Community Activist and a Concerned Citizen. Shukoor is a member of the Community Advisory Council from 2000 till present. He is also a member of various organizations like the Prince George’s Country Public School Military Academy, High Bridge Elementary School; Lutheran Social Services for the Rehabilitation of Bosnian, Kurdish, Haitian and Somalian Refugees (1993-Present) - Providing economical, social, and political support to the Refugees; Winter Haven Homeless Shelter Program in Laurel (1992-1999). Shukoor had served as Administrator and Volunteer at the Homeless Shelter Program. His other services as a volunteer include Habitat for Humanity, Maryland Society for Sight and Voter Registration. As a humanitarian, Shukoor had organized food drives for the homeless in Downtown DC, "Marthas Table". He was the National Coordinator of Social Services of the Ahmadiyya Youth Association (1994-1996), National Vice President of the Ahmadiyya Youth Association with 43 Chapters (1996-1999) and National President of the Ahmadiyya Youth Association with 46 Chapters (1999-2002). Shukoor had also organized blood drives for the community through Red Cross. Last, but not the least he is also a Member of the South Asian Journalist Association (SAJA). Shukoor was nominated for the Presidential Service Award (President William Jefferson Clinton), for the commitment and dedication in doing voluntary services in 1995. He was also nominated for the Governor’s Volunteer Award (Governor Parris Glendening) for the contribution of time and talent in support of various Social Service Agencies during the same year. At the same time, Shukoor was nominated for the Prince Georgian of the Year Award for community service in Prince George’s County. He was also nominated for the Patricia Wallace Outstanding Citizen of Bowie, consecutively during 1994 and 1995. Shukoor has an MPP (Masters in Public Policy) from American University, Washington DC gained during 1999. He took Lobbying as Major and Campaign Management as Minor. He has a double BS, one from Strayer College in (1993) Majoring in Computer Information Systems and another from Osmania University in Hyderabad, India Majoring in Mathematics, Physics and Chemistry in 1983. Shukoor has been happily married for fourteen years to Nabeela Ahmed and has two beautiful daughters, Raaheela (10) and Shabnam (8). The Ahmeds are living in the unincorporated part of Bowie. They have been residing in Prince George’s County since 1988. He is a dedicated husband, a dutiful father and a responsible son. Shukoor Ahmed is a self-described political junkie whose passion for Americas democratic process spurred him to create StateDemocracy.com, a red, white and blue Web site aimed at making it easier for voters to communicate with legislators. "Its a simple concept," said Ahmed, 41, who immigrated to the United States from India in 1988. "It connects citizens with elected officials at the state and federal levels. With a couple of clicks, whatever you have opinions on, you can send officials feedback." The Bowie Democrat, who has run twice, without success, for the Maryland House of Delegates, said his Web site is about making leaders and lawmakers accessible to voters. A visitor to the free site can get e-mail addresses for officials, track legislation, compare lawmakers voting records and even send press releases to media outlets. Ahmed said he saw a need for such a service -- which includes legislative information for all 50 states -- during his 1998 campaign for delegate. "When I was campaigning and door-knocking, I realized a lot of citizens didnt know who their elected officials were at the state level," said Ahmed, who runs a 12-employee software company, V-Empower Inc., and holds a masters in public policy from American University. "In order to strengthen democracy, you need to have informed citizens," he said. He began to build StateDemocracy.com in 1999 and soon brought aboard partners Ken Laureys and Jamie Schloss. In 2002, the site became part of the nonprofit State Democracy Foundation, which he and his partners formed. He hopes to obtain grants to help keep it going. "Id like to get the message to citizens that, hey, this is a site that is a one-stop click away from contacting their legislators on any issue and enables them to provide input on critical legislation," said Ahmed, who along with his wife, Nabeela, a pharmacist, is a naturalized American citizen. The couple has two daughters, Raaheela and Shabnam. "People are busy, generally, and sometimes you want to have an influence but dont have much time," he said. "This site makes it much easier for busy people to be a part of the process." His own political activities have included holding office in local Democratic clubs and organizations and working in 1999 as a legislative aide to then-state delegate John Giannetti, who is now a state senator. In 2002, besides running an unsuccessful campaign for state delegate, he served as director of technology for Prince Georges County Executive Jack B. Johnsons campaign. Hes interested in running again for public office, despite his losses. "I may run again in 2006 [for] state delegate or state senator," said Ahmed, adding that an eventual run for Congress was not out of the question. He believes his experience as an immigrant helps him appreciate the Founding Fathers work. "For a person who has come from a different part of the world, Americas democracy is an amazing process," he said. "In order for the system to work, everybody has to do their part. And I think sometimes people dont want to be part of the game, and thats part of the down-side." His hope, though, is that StateDemocracy.com will make it a little easier for people to get into that game. "The best part of democracy is that it doesnt exclude people, but includes people," he said. "Thats one of the beauties of America, the inclusion and the opportunity." Any registered voter in Utah may use an absentee ballot--but it must be submitted to your local voter’s clerk by June 20, to be valid for the state’s primary elections on June 24. The statedemocracy.com site has recently been redesigned, updated and re-launched, following eight years of service to over 100,000 citizens nationwide. Users merely enter their ZipCode… then click to quickly find the local polling place, local election board, or the state and federal lawmakers for that jurisdiction. As the Internet’s most comprehensive civic engagement site, statedemocracy.com connects constituents to lawmakers on the federal level and in all 50 states. By facilitating grassroots input into government policymaking, statedemocracy.com fosters an ongoing dialog between the government and the governed, covering all issues that The People find important. We are pleased to announce that several FREE Voter Aids are now available to you as a user of www.statedemocracy.com, the 1-stop civic engagement portal that Delivers Democracy to your Desktop! Please take advantage of this free offer right NOW -- well before the deadlines that states have for voter registration and absentee ballots -- and also forward this invitation to all your online friends and colleagues. Please help me support the StateDemocracy Foundation, Inc. by making a tax-deductible donation. Its fast, easy, and secure. Over nearly 8 years, some 600,000 Americans have used this FREE civic engagement portal to connect with their lawmakers on the federal level and in all 50 states. You can also access voter registration and absentee ballot applications, along with a poll locator for anywhere you live! Most recently, the StateDemocracy Foundation launched www.LobbyDelegates.com, which has attracted nearly 30,000 visitors since its launch on April 1, 2008. This free service still remains the only site enabling rank-and-file Democrats to lobby all 800+ Super Delegates on who to back as their party’s Presidential nominee. Check it out! Thanks so much for your support - and please dont forget to forward this page to any friends you think might be interested. American politics has been made easy to understand. Earlier it was difficult to know about what was happening in the country and specifically in the legislatures. No one knew who were the elected official representing counties other than theirs. Today this political scenario has changed dramatically. This is all because of the usage of the internet surfing and browsing as well as communicating and networking online. I was also unaware of many political facts until I reached a website called www.StateDemocracy.com. This website gave me relevant information about the elected officials that helped me in contacting them, as well as getting the necessary information on what happens in the legislatures. Surfing on this site I came to know that about 25 to 30 elected officials have pledged to be part of this site. I think this is something good about US politicians, they do what they say. After seeing this I was amazed to see all info under one roof. This is one site I have come to know if there more such sites on related information please inform me. You may contact shukoor[at]v-empower.com for any further information.